For most Notre Dame students, a typical Friday afternoon in the spring might include a little Frisbee or pick-up basketball, maybe a movie, certainly dinner with friends. 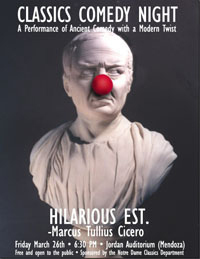 But something a little more atypical attracted more than 200 students to gather on March 26 of this year: 50 young classicists presented “A Night of Greek and Roman Comedy” to a capacity crowd of their fellow students. Doug Schuda, a senior philosophy major with a supplementary major in Greek and Roman civilization, was the choregos (the equivalent of a modern-day producer or director) for one of the comedies, an updated production of Aristophanes’ The Clouds. Just as Aristophanes did, the Classics students had to reinvent The Clouds to catch the interest of their audience. To appeal to their audience, Schuda and his team added new materials and references, including credit-card debt, characters called “Life Coach” and “Lawyer” (to replace what Aristophanes called “Good Argument” and “Bad Argument”), and the mention of popular student haunts such as Finnegan’s and Club 23. The entire evening’s humorous and at times raunchy blend of ancient and modern Western culture helped bring to life for students Aristophanes’ satire about the intellectual fashions of classical Athens. “Actually staging a drama provides valuable insights into the text,” says Tadeusz Mazurek, assistant professor of classics and one of the faculty who helped with the performance. “When we stage a play, we are forced to consider important questions about character development and to notice nuances of humor and embedded stage directions. In addition to the performance of The Clouds, the event also included the student’s version of Plautus’ play The Brothers Menaechmi. The night of comedy was introduced by professor Edith Hall, a Provost’s Distinguished Women’s Lecturer, who commented on the two plays adapted by the students and shared her experiences staging ancient dramas. Hall is a scholar of classics and cultural history, and holds a joint Research Chair in Classics and Drama at Royal Holloway, University of London, where she directs the Centre for the Reception of Greece and Rome. She also co-directs a research project at Oxford University and is chairman of the Gilbert Murray Trust. Originally published by Michelle Romeu at al.nd.edu on April 18, 2010.